How to connect two PBX systems to work as one? Ozeki VoIP SIP SDK saves you a great deal of effort by providing professional background for PBX development. This article presents how you connect two SIP PBX systems in order to make them work as one PBX using Ozeki SIP SDK. You can also learn how to build a PBX cluster to have a redundant VoIP system. You can use clustering to be prepared for hardware failures. Why should be PBXes connected together? PBX systems are basically for establishing phone lines for VoIP clients. These systems need to provide great reliability and stability. The expected reliability of a PBX system is five 9s that means that the system has to be reachable in 99,999% of time excluding planned shutdowns. You can provide this great reliability by using more PBX systems at the same time. This does not necessarily means that your system will look like using more PBXs as you can config them to look like a single one with the help of Ozeki VoIP SIP SDK (Figure 1). You would also need to connect two PBX systems together when you have more office departments where you want to use separate PBXs. In this case the office PBXs are connected to each other and the inter-office calls are made by having only one line established between the PBX systems. This allows the usage of only one port for internal calls. Creating redundancy in a VoIP network increases the reliability and the performance of the system. The PBX system reliability should be five nines (99.999%) that means that the network downtime cannot exceed 5 minutes in a year except for the planned system shutdown. When you use more PBX systems as one, if one of them goes down for any reason, the other can take over and handle the calls so the users do not notice the problem at all. Using more PBX systems in a network can also handle the case when the company has more than one offices in different locations and they want to use a connected VoIP communication network. In this case the PBX systems handle the subnetworks and they are connected to each other in order to assure the communication between the far away employees like they were in the same office. Building a PBX cluster, you can achieve higher availability to your PBX. The aim of a highly available system is to provide continuous VoIP service. How to implement PBX cluster using C#? A PBX (created with Ozeki VoIP SIP SDK) cluster is based on the Microsoft Cluster Server technology. This means that if a failure occurs on a server that is a member of the cluster (for example on PBX 1 or PBX 2), the VoIP service that the failing server was hosting will automatically restart itself on another server that is a member of the same cluster. To build an Ozeki VoIP SIP SDK PBX cluster you need to have Windows Server (2003 Enterprise Edition or Datacenter Edition, 2008 Enterprise Edition or Datacenter Edition or Windows Server 2012) installed on all computers in the cluster. We recommend you to use the latest service packs for Windows Server, but it is important to install the same service pack on all computers in the cluster. All nodes in the cluster must be in the same architecture. This means that if you use x86-based Windows Server on one node, you need to use the same on the other node, as well. Important: Microsoft supports a failover cluster solution only if all the hardware components are certified for Windows Server. In addition, the complete configuration (servers, network, and storage) must pass all tests in the Validate a Configuration Wizard, which is included in the Failover Cluster Manager snap-in. Concerning hardware, please refer to the Microsoft Cluster Server Administrator's Guide for a list of supported hardware configurations and hardware configuration information. The VoIP SIP SDK PBX service that the cluster runs uses resources of the cluster nodes. The VoIP service running on the cluster has its own Hard drive assigned to it (which is shared with the other failover cluster nodes), it has its own IP Address and it has its own Network name. All of the resources that a clustered VoIP SIP SDK PBX service uses are called a Resource Group. The Resource group contains the basic resources that the VoIP SIP SDK PBX service needs, Disk Drive, IP Address, and the service itself. All of these together form a virtual server that can be moved from one server to another in a matter of seconds (Failover) without any dependence on a specific server. The user that accesses this virtual VoIP SIP SDK PBX server will be exposed to it like to any other VoIP SIP SDK PBX installation. What is shared storage? How does it work? To setup a fault tolerant PBX cluster, the first thing to do, is to build a shared storage facility. This facility should have a disk subsystem that uses RAID (Redundant Array of Independent Disks). If you study the PBX_Database example, you will see the PBX is using local (.mdf) database for the purpose to get information about extensions. You can configure the PBX to handle any database types, and if one of the PBXes wouldn't be able to functioning, the other one in the cluster would take it's position, and would start to use the set database. This way, all PBXes within the same cluster have the exact same extension information. How to handle network connectivity? Each node of the VoIP PBX cluster should have two network adapters - one for connection to the public network and the other for the node-to-node private cluster network. If you use only one network adapter for both connections, your PBX cluster will not work. How to install and set up the cluster? During the initial installation, please make sure that you install the same PBX version on both nodes of the cluster. Concerning the installation path, all files should be installed to the shared disk resource. The following guide gives instructions about how to setup Microsoft Clustering Service using Windows Server 2003 Datacenter Edition or Enterprise Edition. If you use a newer version of Microsoft Windows Server, such as 2008 or 2012, you can use the links below under the References. After you have installed the Windows OS on the first node and before you install Microsoft Cluster Service, you need to check your system. First click Start, select Programs and Administrative Tools, and then click Configure Your Server. 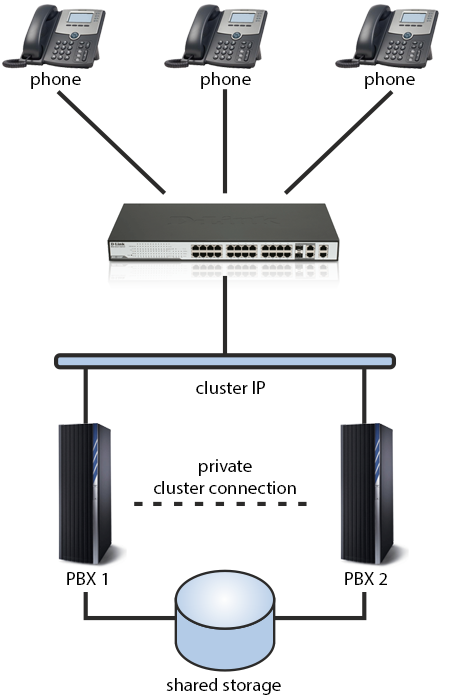 Here, select Advanced \ Cluster Service, and then in the right panel click Learn More. In the Windows Help menu, review item 2 in the "Windows Clustering" topic to be familiar with the technology and the installation steps. Important: You must read the "Planning for Windows Clustering\Requirements" for server clusters and follow the checklist for server clusters named "Checklist: Creating a server cluster". The "Checklist: Creating a server cluster" topic is located under the "Server Clusters section\Checklist" for server clusters topic. You need two Ethernet controllers. One of them should be connected to the Internet, while the other should be connected to a private network. For example there are two network cards in the computer: Local area connection and Local area connection 2. Suppose that the first is connected to the Internet with IP address: 192.168.90.101 and the second is connected to a private network with IP address: 10.0.0.101. You need two disks: one of them will host the Windows installation, the other will be the shared (quorum) disk of the cluster. Your PBX will be installed on the shared disk to store sensitive information, such as SIP account or call logging information. If your hardware is ready, you can create your cluster. Click on Start menu and select Cluster Administrator from the Administrative Tools menu. Then follow the installation steps. Select Create new cluster, specify a unique Cluster name (e.g. "clustern1"), enter an IP address that cluster management tolls will use to connect to the cluster. Later, you need to use this IP address to connect your VoIP phones and devices to your PBX. In addition, here you need to give login information for the domain account under which the cluster service will be run. Now your cluster is ready on Node 1. After the cluster has been created, you should add a second computer to it. The name of this computer will be "clustern2". Please note that "clustern1" and "clustern2" should be the member of the same domain. In the Cluster Administrator Window, right click on the name of the cluster and select New Node. Provide a name and follow the instructions during the installation. After you have added Node 2 to this cluster, you can see both of the clusters in the list of the Cluster Administrator Window. After the cluster has been prepared, you should install your PBX to cluster Node 1. The installation destination directory should point to the shared disk. This means that your configurations, SIP account data, call loggings will be saved on Node 2 as well. The next step is to register your PBX as a cluster resource. Right click on Rescource and then select New Resource in the Cluster Administrator Window. Provide a name for this Resource and select Generic Service, as a Resource type. Click on Next button, then select "clustern2" as a possible owner on which this resource can be brought online. In the Dependencies window, select Cluster IP Address and Quorum Disk in the Resource dependencies section. Finally, provide a service name and click on FInish. Then a popup window shows you to created the cluster successfully. After you PBX has been registered as a cluster resource, it's service entry should be added to Node 2.
inssrv.exe install "OzekiPBX" "OzekiPBX" "Q:\OzekiPBX\OzekiPBX.exe"
Now, your PBX cluster is ready. If there is a hardware failure on Node 1, Node 2 can take over the control. What common tasks should be handled? Version upgrade: To upgrade your PBX in your cluster to a new version in an active/passive configuration, you need to install the new version on the primary node only. The installation will update all files on the shared storage. The service registration of the old version (on the passive node) will work for the new version as well. What alternative clustering technologies are available? Please note that, this example does the same tasks as the VoIP PBX authentication example, the only difference is the database management instead of using the UserInfoContainer class. GetUserInfo(): receives a username, and return with a UserInfo object, which contains the informatin about the user, set in the database. It's recommended to use the TryGetUserInfo() method before using this one, to check if the database contains the user. The example is using local (.mdf) database for the purpose to introduce a simple solution of PBX database handling, but you can - of course - use any database types and your own functions. These are only for the purpose to represent a very simple PBX which can handle a database.